If you're looking for a new off-road ready, compact SUV that can handle everything from your commute around town to your next adventure, look no further than the new 2019 Jeep Compass! 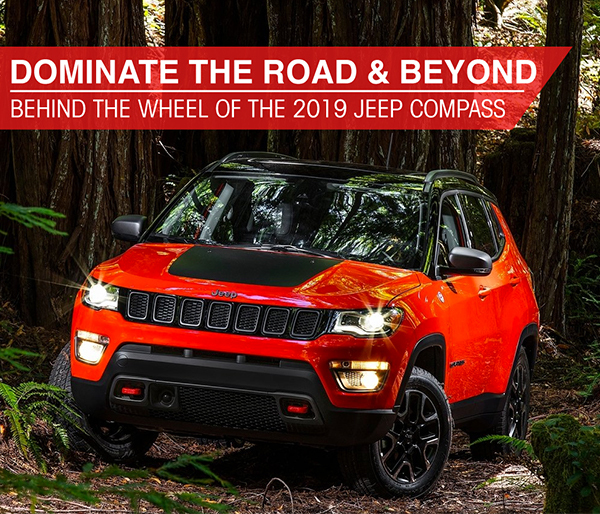 The 2019 Compass is available in 5 versatile trims including Sport, Latitude, Altitude, Trailhawk and Limited; so you can choose your level of performance. Test-drive the new 2019 Jeep Compass today at Southern Chrysler Dodge Jeep RAM Norfolk and experience everything it has to offer today. Who says a compact SUV can't be mighty? The 2019 Jeep Compass is made to perform! Get behind the wheel of one of 5 of its versatile trims and you won't be disappointed. Equipped with a 2.4 L Tigershark® MultiAir® 2 engine and paired with a 9-speed automatic transmission, the 2019 Compass can deliver up to 180 horsepower and up to 175 lb.-ft. of torque! In fact, with that much power and when properly equipped, the 2019 Compass can tow up to 2,000 lbs! That's enough to haul anything from a small boat to a couple of snowmobiles. True to its Jeep heritage, the 2019 Jeep Compass delivers the same smooth ride, even on the roughest roads, that made its namesake an icon. In fact, when you choose the 2019 Jeep Compass Trailhawk, you'll also discover a powerful drive that can manage snow, sand, mud and rock. The 2019 Compass Trailhawk can also forge in water up to 19 inches and is designed to climb and maneuver on even the toughest terrain, thanks to its Best-in-Class 4x4 capability. Drive with the added peace of mind of knowing that the 2019 Jeep Compass was designed with the latest innovations in safety! Every Jeep Compass comes with a complete suite of safety technologies to help you drive even on the roughest terrains. The 2019 Jeep Compass is also made with a high-strength steel frame designed to work with its sophisticated airbag system to help protect you and your passengers in case of a collision. One great advantage of buying or leasing your new 2019 Jeep Compass from Southern Chrysler Dodge Jeep RAM Norfolk is the Southern Hospitality Buyers Program! It's an amazing group of benefits included with your purchase that adds extra value throughout the lifetime of your vehicle. Best of all, it's included at no additional cost to you! Take a look below to see just how much you can save with the Southern Hospitality Buyers Program from Southern Chrysler Dodge Jeep RAM! Test-Drive Your New 2019 Jeep Compass At Southern Chrysler Dodge Jeep RAM Norfolk! Ready to get behind the wheel of the new 2019 Jeep Compass? Don't wait! Fill out the form now to schedule your test drive, then visit us today and discover everything it has to offer! Southern Chrysler Dodge Jeep RAM Norfolk carries an extensive selection of new Jeep Compass models in different colors and with different options for you to choose from! We proudly serve drivers from Hampton, Virginia Beach and the surrounding areas.